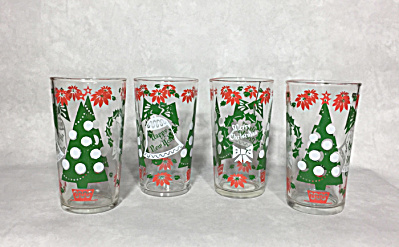 This set of four 5 1/4 inch tall hiball cocktail glasses with Christmas tree, bells, a wreath, poinsettia and holly was made by the Continental Can Company whose logo is composed of three concentric stylized letter "C"s inside each other. The Continental Can Company purchased the Hazel Atlas Glass Company in 1957 but in 1964 12 of the 14 plants of Hazel-Atlas were acquired by the Brockway Glass Company. This mark thus dates these glasses are pre-1957. The designs on these glasses are consistent with a 1950s production date as they display some of the popular motifs used on Midcentury graphics in particular the use of highly stylized leaves and foliage wherein the leaf is either in a split style or where the veins are highlighted. I love the stylized version of the Christmas tree and ornaments in this design! In these glasses, the holly leaves are green but the veins are clear. One one side it states Merry Christmas while on the other side it states Happy New Year inside a bell. In terms of color, the use of forest green along with the expected red and white places these squarely in the 1950s. So, time to search out a vintage Midcentury cocktail book for some classic recipes as well as perhaps a vintage cocktail shaker, invite a few friends over and celebrate the season.